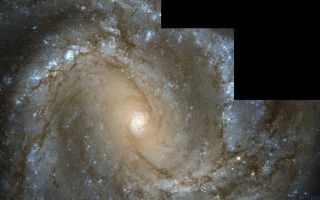 The NASA/ESA Hubble Space Telescope has captured this cool space wallpaper of nearby spiral galaxy Messier 61, also known as NGC 4303. In this image the galaxy is seen face-on as if posing for a photograph, allowing us to study its structure closely. The NASA/ESA Hubble Space Telescope has captured this cool space wallpaper of nearby spiral galaxy Messier 61, also known as NGC 4303. In this image the galaxy is seen face-on as if posing for a photograph, allowing us to study its structure closely. The spiral arms can be seen in stunning detail, swirling inwards to the very center of the galaxy, where they form a smaller, intensely bright spiral. In the outer regions, these vast arms are sprinkled with bright blue regions where new stars are being formed from hot, dense clouds of gas. This image was released June 17, 2013.